NPR: What’s in those tank cars near the Amtrak derailment? What’s in those tank cars near the Amtrak derailment? News footage of the Amtrak derailment in Philadelphia Tuesday night shows nearby tank cars that look similar to the rail cars carrying crude oil or other hazardous material across the country each day. In aerial photos, it looks as if the Amtrak train, traveling at 100 miles an hour, nearly missed creating an even greater catastrophe, if it had struck an oil train, say, or a train carrying chlorine gas. Residents quickly took to twitter, wondering what about the content of those tank cars, and whether it was hazardous. “This could be just one more in a litany of near misses,” said David Masur, director of PennEnvironment, an activist group working to ban oil trains. It wouldn’t be far-fetched for a passenger rail car to collide with an oil train, dozens of oil trains run through the state on their way to Philadelphia and South Jersey refineries each week. In fact, Norfolk Southern runs oil trains on a track that runs above Amtrak lines, close to the derailment. Bakken crude oil from North Dakota crosses those lines daily, traveling across the Delaware river, and down to refineries in South Jersey. 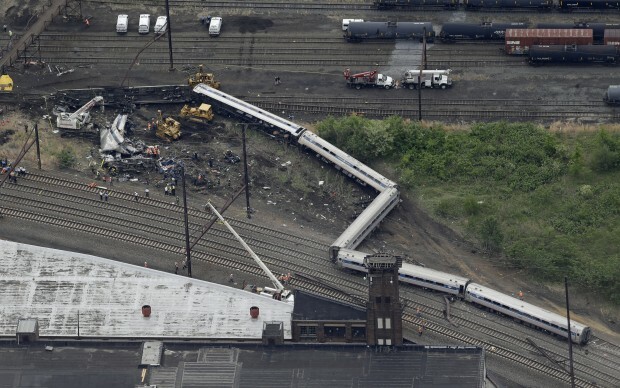 WHYY reporter Tom MacDonald says he saw the black tankers about 50 yards from the derailed Amtrak train. But it’s still unclear what is in those tank cars. “It could be corn oil, it could be very benign stuff,” said Conrail spokesman John Enright. The accident occurred on Amtrak’s rail lines, but the scene is very close to a Conrail yard, which Enright says is used for local transport. Enright says Conrail knows what’s in the cars on their tracks but considers it proprietary information, not to be revealed unless there’s an emergency. “If there was an incident then that information would be readily available to [first responders],” he said. In this case, the Amtrak train did not hit any nearby freight cars, so the contents of the blank tankers remains a mystery. Norfolk Southern, which operates the oil trains that cross the Amtrak line, did not respond to requests for comment. And the American Association of Railroads would also not comment on the freight rail traffic in the area. Philadelphia’s Office of Emergency Management would not comment on the contents, saying they were focusing on the accident itself. But rail safety experts say the accident could have been much worse if the Amtrak train did hit those black tank cars, and if those cars were carrying explosive or flammable material. Fred Millar is an independent rail safety expert. “Having the oil train sitting there is not necessarily an undangerous situation,” said Millar. Millar says, although it’s rare, trains have been known to run into each other. Federal investigators recently released a report about an oil train explosion in North Dakota in 2013, where the train hit a derailed freight train. “One kind of industrial accident can set off another,” he said. Not only would the death toll be higher, but the neighborhood would need to be evacuated. Jim Blaze is an economist and railroad consultant who worked in the railroad industry for 30 years. Not only is it unclear what’s in those nearby tank cars. It’s unclear if Philadelphia’s first responders would be ready. The city’s Office of Emergency Management says it’s done exercises to prepare. But it’s not clear if the exercise has included passenger rail cars. Pennsylvania’s Emergency Management Agency spokesman Cory Angell says that’s not a scenario he’s heard discussed. Delaware County’s Office of Emergency Management says the risk of an Amtrak or regional rail line hitting an oil train is low because the passenger rail cars don’t run in close proximity to the oil trains as they do in Philadelphia. Ed Truitt runs Delco’s OEM. “We’ve looked at a lot of different scenarios and that was never conceived as being a threat in Delaware County,” said Truitt. Truitt says the rail cars only travel between midnight and 5 AM through the county. Meanwhile, the American Petroleum Institute filed a lawsuit on Tuesday to block the implementation of new oil train safety rules.